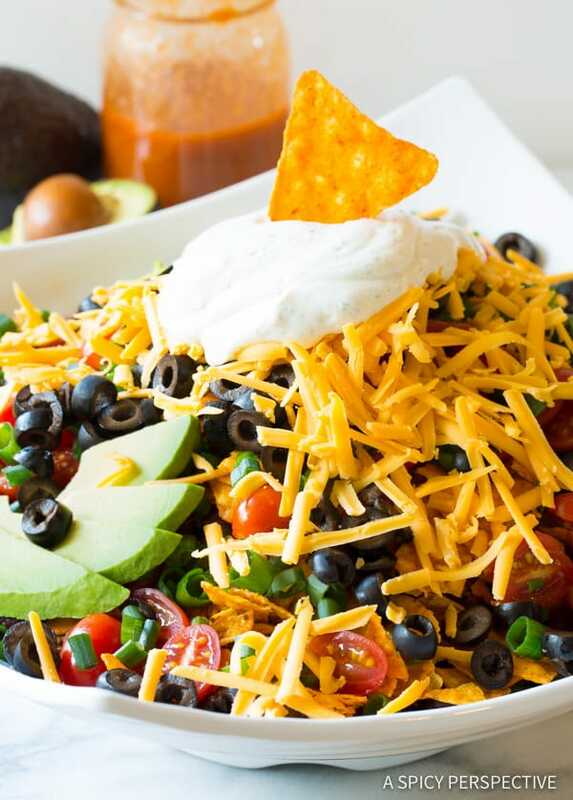 Ultimate Dorito Taco Salad Recipe: An All-American version of a classic taco salad with layers and layers of texture and zesty flavor. 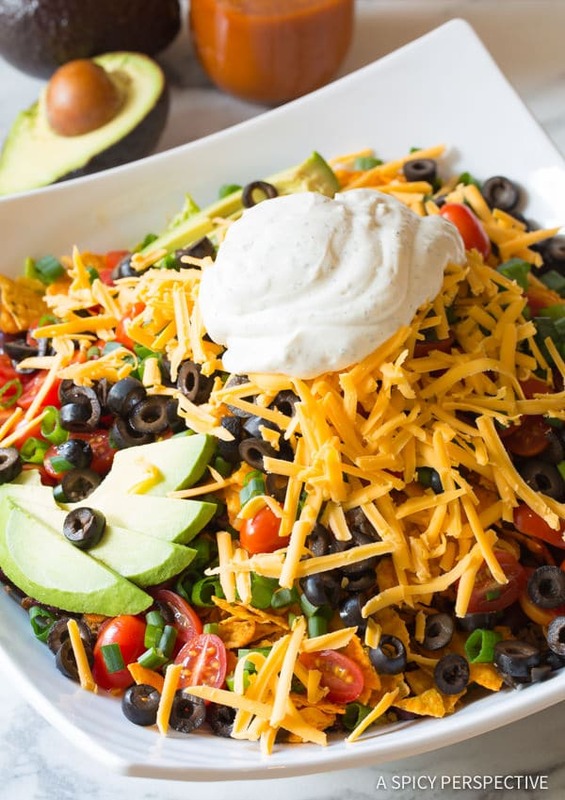 Taco salad is a beloved go-to dinner at my house. No one ever looks disappointed when I carry a big heaping taco salad to the table… Especially if it has crumbled Doritos in it. 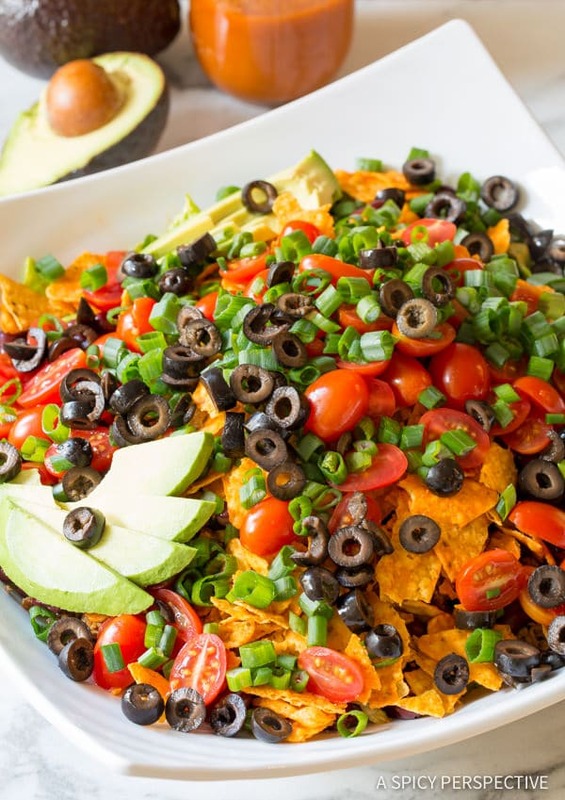 Introducing the Ultimate Dorito Taco Salad Recipe! 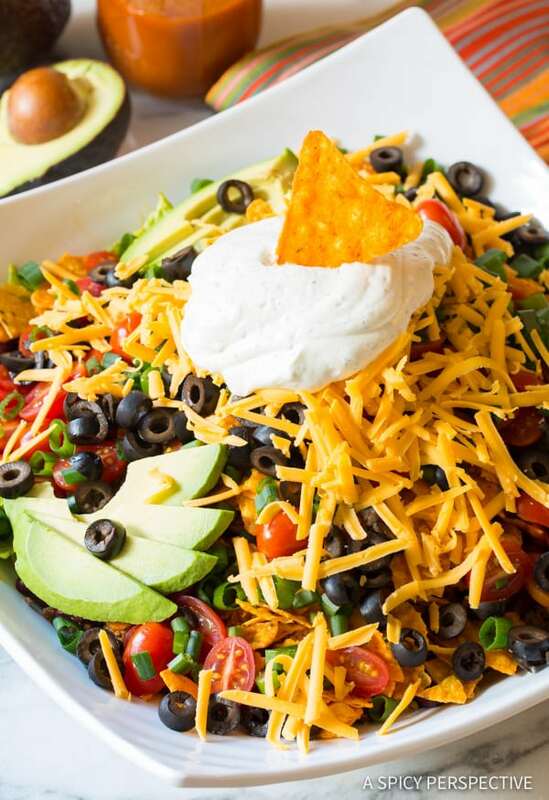 The fusion of Tex-Mex flavors, fresh crunchy produce, and All-American snack ingredients is an absolute crowd-pleaser for family dinners and casual parties. 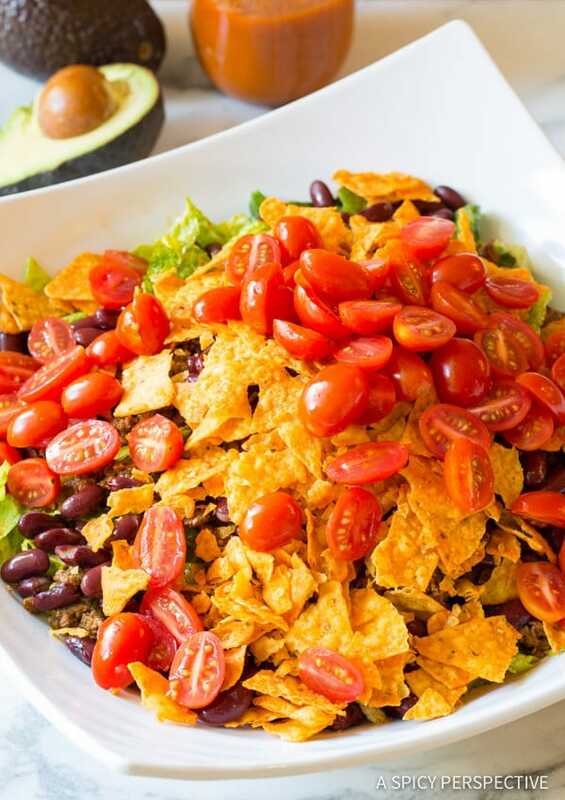 However, today I wanted to share a version that I lovingly call The Ultimate Dorito Taco Salad because it offers more fresh produce and a little extra naughtiness! Plus it is so colorful and pretty, perfect for brightening days and faces. I like to start by making a quick Homemade Catalina Dressing. It’s much bolder and slightly less sweet than the store-bought varieties. The recipe is super simple. Basically, add all of the ingredients together in a blender except the oil. 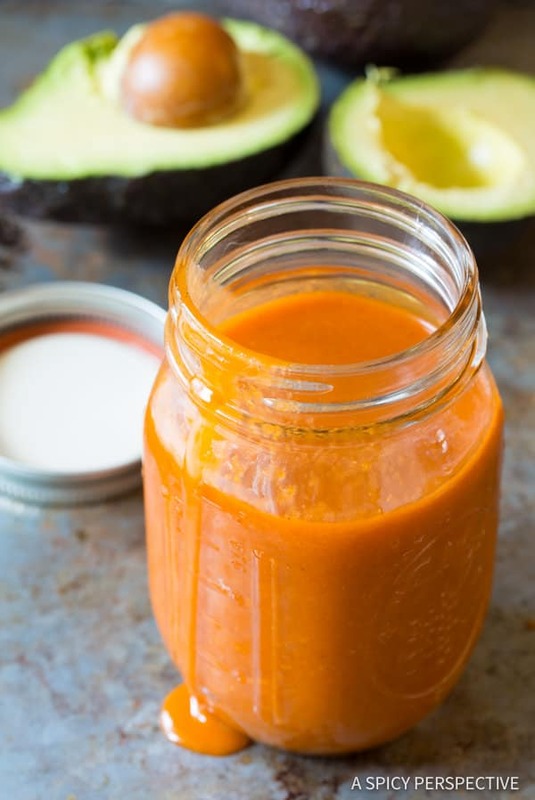 While the blender is still running add oil until the dressing is emulsified. That’s it! Brown ground beef and mix it with taco seasoning. You can use any taco seasoning you like or make it homemade! 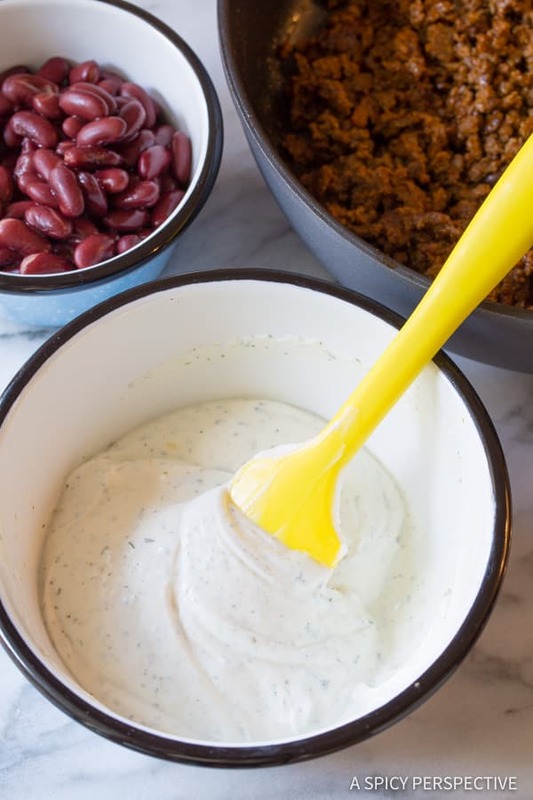 Then mix sour cream with ranch dip mix to have a zesty creamy topping for the Ultimate Dorito Taco Salad Recipe, to give it chip-and-dip appeal. Taco Meat – a staple in all taco salads. 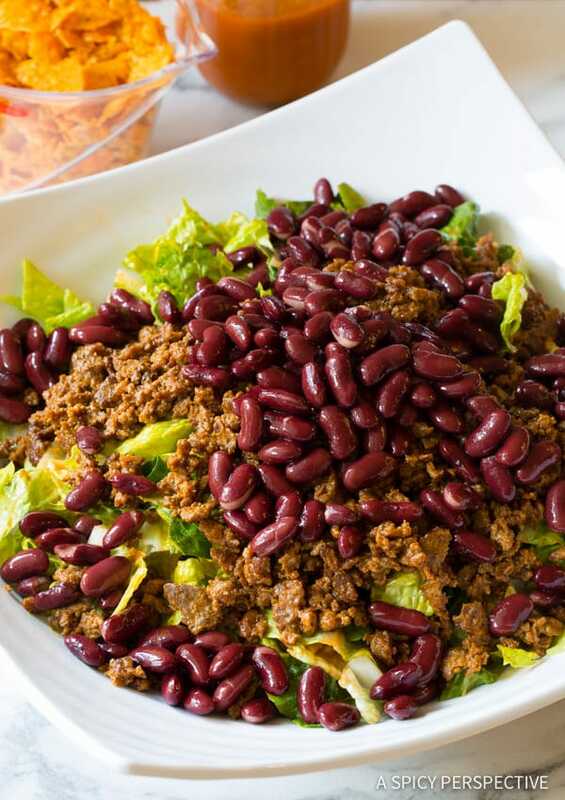 Kidney Beans – if you wanted to make this a vegetarian dish, simply leave out the taco meat and only put in the kidney beans. Crumbled Nacho Cheese Doritos – this is what makes this recipe special and oh so tasty! Grape Tomatoes – cut in half, these tomatoes are a bite of fresh, sweet, and acidic flavor. Chopped Green Onions – onions give this salad a little umph! Black Olives – an essential taco topping! But if you don’t like olives, feel free to not add them. Avocado Slices – creamy, fresh avocados slices give this salad depth with a contrasting texture to crunchy. Shredded Cheddar Cheese – you can’t go wrong with cheese, right? 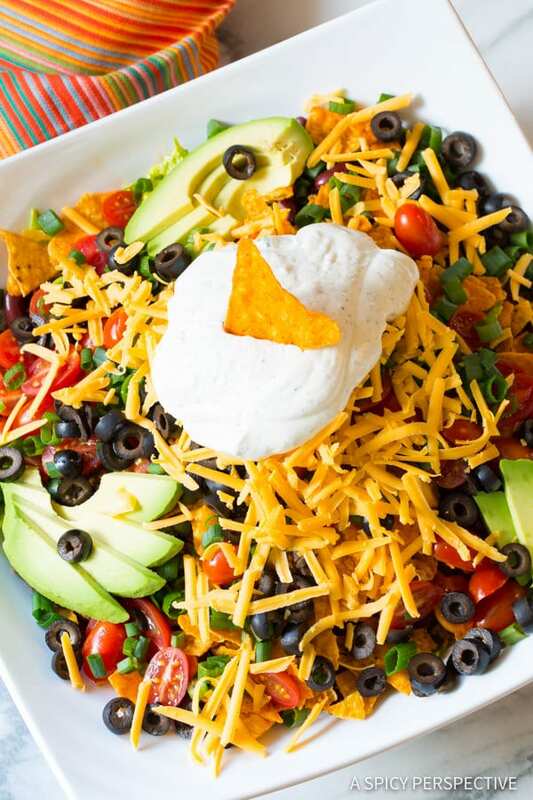 And finally the Creamy Ranch Dip – this dip enhances this Dorito taco salad like crazy, so don’t skip out on this ingredient! If you are looking for a more spicy taco salad, try adding sliced pickled jalapenos and Tabasco sauce, like one of our readers tried and loved! 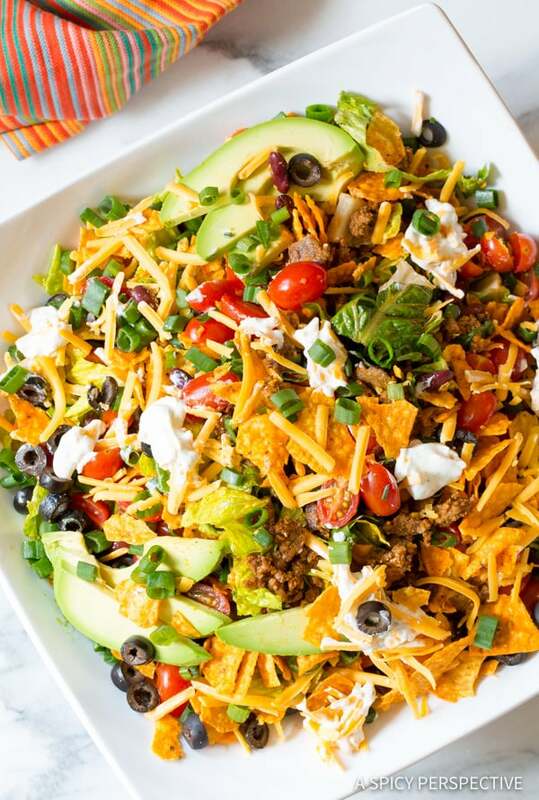 The crushed Doritos give the taco salad intense flavor and crunch, while the ranch dip provides a zesty cool balance to the hot taco meat. Heaven. 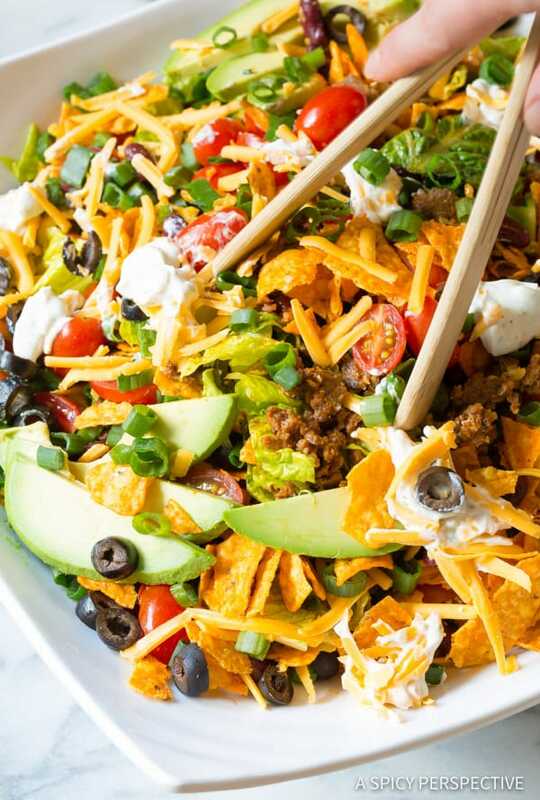 The Ultimate Dorito Taco Salad Recipe is pure heaven. However, this may not be the healthiest salad on A Spicy Perspective, but I assure you, your family will think it’s one of the best. 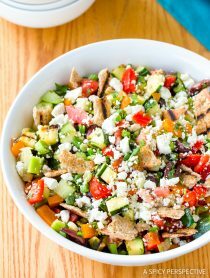 If you’re super worried about the health standard of this salad, you can take the fat and calories down a few notches by using Baked Doritos, lean ground beef or ground turkey, low-fat sour cream, and low-fat cheese. And if you have any allergies or intolerances, simply omit or sub out the ingredients that don’t work for you or your family. 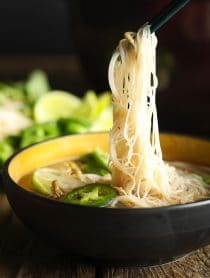 This recipe is super versatile! So why not surprise your family with this heaping pile of goodness tonight!? See The Recipe Card Below For How To Make Ultimate Dorito Taco Salad Recipe. Enjoy! Place the ground beef in a large skillet over medium heat. Brown the meat and break into small pieces with a wooden spoon. Then stir in the taco seasoning and 1/3 cup water. Simmer until the water is absorbed, then remove from heat. Mix the sour cream with the ranch dip mix. Chill until ready to serve. Chop the lettuce and pile in a large serving bowl. 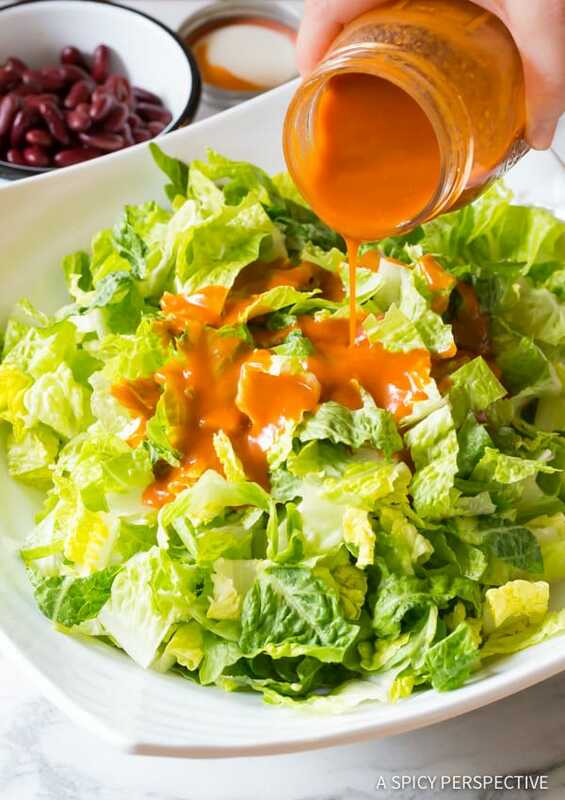 Toss with the Catalina Dressing and add a little more if you so desire. Then pile the taco meat and beans over the top. Next pile on the crushed Doritos, tomatoes, green onions, avocado slices, olives, and cheese. Finally, top the salad with a heaping portion of ranchy sour cream and serve! I made this last night and it was delicious!!! I loved the Catalina dressing…it was so different yet so delicious. The only change I made was to add sliced pickled jalapenos and to mix in lots of Tabasco sauce (I love spicy food). My husband loved it as well. Just made this for the family and everyone loved it!!! The only thing I would do differently next time is put the lettuce in a separate bowl because it does get soggy. Other than that it was incredible and had great flavor. We were all pleasantly surprised! YUM!!! I WILL be making this again!!! Delicious! I shared your link for this recipe on my blog :) Thanks for posting! I don’t know any kid (or adult) who would turn this salad down – looks so good! 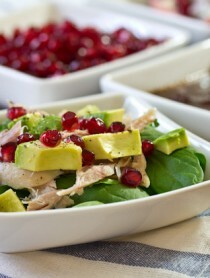 I wish I had this salad for lunch today! I need this salad in my life now! I made this salad for dinner tonight and it was a big hit. Lots of yummy textures going on. This is a keeper! Thanks for sharing. Now THIS is a taco salad! It looks incredible! What a great looking Taco Salad!! !